Goal setting is a process of identifying what you want to accomplish and creating a plan to achieve those desired results. Your goals should be grown from your values, beliefs, desires, and your sense of purpose. Before you begin to create our goals, you should go through the process of self-discovery. Complete a Self-assessment (who am I?) of your values, beliefs, hopes, dreams, and your sense of purpose. A personal mission statement is an individual statement that declares who you want to be, what you want to do, and the values and principles upon which your life is based. Determining your values and mission in life is a critical process of goal setting. Goals that are aligned with your values and your personal mission are the most motivating and inspiring goals. These are the ones that you are most passionate about. They also deliver the greatest sense of pride and satisfaction once accomplished. You should set your goals so they are directly aligned with your life’s mission and purpose. If your goals do not reflect your values or sense of mission, you will struggle to find the motivation to reach them. For example, if your highest value is “time with family”, you want to consider building that into your goals. Self-Discovery will guide you to what you need to change in your life or where your focus should be. Your personal vision statement is your depiction of your life in the future. It should be a vivid description of where you ultimately want to be in life. It may detail who you have become, what you are doing, who you are with, and what have you accomplished. 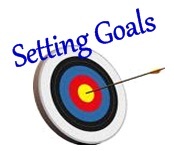 Goal setting incorporates setting both long-term goals and short-term goals. Long-term goals are achieved over time as you complete the stages of your life. Long-term goals will typically be achieve more than a year from when you set them. 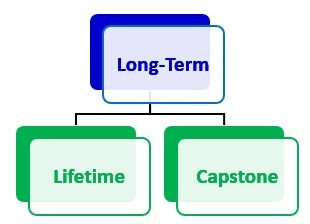 Long-term goals can be either Lifetime goals or Capstone goals. Short-term goals, on the other hand, are ones that a person will achieve in the near future, typically in less than one year. Short-term goals are often, but not always, steppingstones on the way to achieving long-term goals. 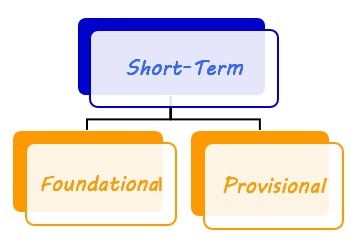 Short-term goals can be further categorized be either Foundational or Provisional goals. 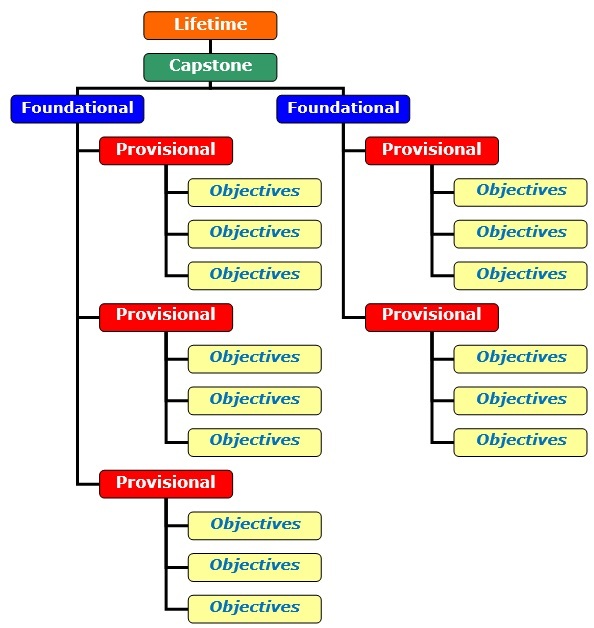 After you set your Lifetime goals, set intermediary goals (Capstone goals) that will lead you to your desired goals. Remember to set your goals so they are directly aligned with your life’s mission, purpose and passion. Create goals high enough to ignite your spirit and inspire you to take action. Write down all your goals in specific, measurable detail with declared target dates. Create a set of goals to be completed within the next year that will help you reach your long-term goals. Set a series of related monthly goals that are tied to your long-term and foundational goals. Share your goals with others for incentives, accountability, and motivation. By sharing your goals, you create a sense of accountability. People may ask you about your goals, and you will want to have a positive response for them. You will want to tell them how well it is going and how much you have accomplished already. Also, by sharing your goals, others can give you motivation and encouragement to achieve them. Set a whole series of related daily and weekly tasks or objectives that will help you reach your goals. Include starting times and completion dates. Take 10 minutes every week to review your goals. You want to keep them in the forefront of your mind. Take an action step toward the attainment of at least one goal every day. This is the key to peak performance and maximum achievement. Evaluate your goals on a regular basis to be sure they are still your most important goals. Things change. You may have to readjust your goals as you move thorough life. You will find yourself adding goals to your list as time passes. You will also find yourself deleting goals that are no longer as important as you once thought. Commit to hitting each of your targets. Resolve to never quit.